St. Paul's is a Board of First Fruits Church similar to many others in the country. The Board of First Fruits was set up to enable a programme of church building throughout the country so that every one had a church within walking distance. There were four suggested plans and it is possible to see examples of these in many different locations in Ireland. This church was built in 1811 at a cost of £850 and is built entirely of granite. The east end was added in 1880, the sand used in the building being dug from the foundations. There is an arch visible in the wall which looks as if it might be for an extension but in fact this was a strengthening feature due to a fault in the sandy ground below the wall. The silver in use dates back to 1812 and was originally used in the old church of Barragh a mile or so away. 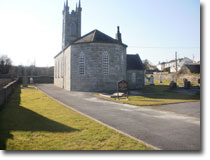 When Barragh, a very much older church, was destroyed by fire the present church of Kildavin replaced it. There was a Sexton's house and stables in the grounds until the nineteen seventies but this was demolished and the site is now part of the church grounds used for car parking. The Church and graveyard was once surrounded by country fields and looked idyllic in old photographs. Now it is situated at a crossroads surrounded by houses in the recently bypassed village of Kildavin. The Church is lovingly cared for and has a very loyal congregation who attend most faithfully.